Comprising an array of versatile and compact primes, the Loxia Lens Bundle from ZEISS is a complete lens kit well-suited for digital cine applications. Included in the bundle are the Loxia 21mm f/2.8, 25mm f/2.4, 35mm f/2, 50mm f/2, and 85mm f/2.4 lenses; a dedicated Transport Case/Bag; and five of the Mini Lens Gears for using these lenses in conjunction with a follow focus. Featuring a compact form factor well-suited for full-frame Sony E mount mirrorless cameras, the Loxia 21mm f/2.8 Lens from ZEISS is a wide-angle prime based on the Distagon optical concept for a marked reduction in distortion as well as consistent, even illumination and sharpness from edge to edge. The optical design also incorporates four anomalous partial dispersion elements and one aspherical element to control chromatic aberrations and increase overall clarity and color accuracy. A ZEISS T* anti-reflective coating has also been applied to lens elements to minimize lens flare and ghosting for greater contrast. Loxia lenses are distinct in that they feature a manual focus design that has been specifically tailored for use with electronic viewfinders, and also feature a manual aperture ring that can be de-clicked for silent operation; making them especially well-suited to filmmaking applications. The all-metal lens barrel incorporates engraved focusing and depth of field scales, and a 90° focus throw offers fine-tuned control over focusing position as close as 9.8" away. Additionally, a weather-resistant gasket is featured at the lens mount to protect the lens-camera interface from dust and moisture. - Prime wide-angle lens is designed specifically for full-frame E mount mirrorless cameras, however can also be used on APS-C models where it will provide a 31.5mm equivalent focal length. - Bright f/2.8 maximum aperture permits working in low-light conditions and also helps to maintain the compact overall form factor of the lens. - Based on the Distagon optical concept, this lens delivers virtually distortion-free performance that pairs well with the broad angle of view. - Four anomalous partial dispersion elements and one aspherical element combine to limit chromatic and spherical aberrations for cleaner, sharper image quality. - ZEISS T* anti-reflective coatings have been applied to each lens surface to help minimize reflections in order to provide greater image clarity, contrast and color fidelity. - Manual focus design is accentuated by a knurled metal focusing ring, 90° focus ring rotational angle, and engraved depth of field and distance scale markings. - The manual aperture ring can be mechanically 'de-clicked' for smooth, silent rotation throughout the aperture range; making it ideal for video applications. - The lens mount is fitted with an electronic interface that conveys all lens EXIF data to the camera and can also be configured to automatically activate the camera's focusing magnification function when turning the focus ring. - An all-metal lens barrel is fitted with a weather-resistant gasket at the lens mount to protect against moisture and dust from reaching the image sensor or rear lens element. Featuring a compact form factor at only 2.9" in length, the Loxia 25mm f/2.4 Lens from Zeiss is a wide-angle prime designed for full-frame Sony E-mount mirrorless cameras. It is based on the Distagon optical concept, providing an image that is notably sharp and free of distortion from edge to edge. The optical construction also incorporates two anomalous partial dispersion elements and one aspherical lens to help control chromatic aberrations and increase clarity and color accuracy. Applied to all elements is Zeiss' T* anti-reflective coating that minimizes lens flare and ghosting. Loxia lenses have a manual focus ring that has been specifically tailored for use with electronic viewfinders, and also offer a manual aperture ring that can be de-clicked for silent operation. Both of these features make this lens especially well-suited to filmmaking applications. The durable all-metal barrel incorporates engraved focusing and depth of field scales for easy operation, and a 90° focus throw gives you fine-tuned control over your composition. For added protection, the lens mount features a weather-resistant gasket to help prevent any dust or moisture from entering your equipment. - Prime wide-angle lens is designed specifically for full-frame E-mount mirrorless cameras, however can also be used on APS-C models where it will provide a 37.5mm equivalent focal length. - Bright f/2.4 maximum aperture permits working in low-light conditions and also helps to maintain the compact overall form factor of the lens. - ZEISS T* anti-reflective coatings have been applied to each lens surface to help minimize reflections and provide greater image clarity, contrast and color fidelity. - The manual aperture ring can be mechanically 'de-clicked' for smooth, silent rotation throughout the aperture range; making it suitable for video applications. Marrying traditional handling with a digitally-optimized design, the ZEISS Loxia 35mm f/2 Biogon T* Lens is a prime wide-angle lens for full-frame Sony E-mount mirrorless digital cameras. Its manual focus design has been developed in specific regard for use with electronic viewfinders, and also features a manual aperture ring that can be 'de-clicked' for silent operation best-suited for filmmakers. Utilizing a nearly symmetrical optical layout based on the Biogon concept, this lens incorporates one element made from anomalous partial dispersion glass in order to suppress chromatic aberrations and distortion. Additionally, a ZEISS T* anti-reflective coating has also been applied to individual lens elements to further reduce lens flare and ghosting for consistent image clarity and contrast. Serving as a unique option for the contemporary image-maker, the ZEISS Loxia series of lenses are built for the imaging demands of modern full-frame digital cameras, yet are founded upon conventional manual controls. The moderate wide-angle perspective pairs well with the f/2 maximum aperture for selective focus control, as well as enhanced performance in low-light conditions. Furthermore, the handling details of the lens have also been enhanced for maximum feedback and precision, including a long 180° focus through, clearly engraved scale markings, and a robust, all-metal construction with weather-resistant lens mount gasket. Additionally, the lens is fitted with an electronic interface that conveys all EXIF data to the camera and can also be configured to automatically activate camera-based focusing aids during use. - Prime wide-angle lens is designed specifically for full-frame E-mount mirrorless digital cameras. However, this lens can also be used with APS-C sized E-mount cameras, where it will provide a 35mm-equivalent focal length of 52.5mm. - Fast f/2 maximum aperture benefits working in difficult lighting conditions and also enables greater control over focus placement for shallow depth of field and selective focus applications. - One element made from anomalous partial dispersion glass helps to suppress chromatic aberrations for greater clarity and color accuracy around subject edges throughout the aperture range. - Based on the Biogon optical concept, the lens features nine elements in six groups that are arranged in a nearly symmetrical design. This helps to reduce the physical size of the lens as well as minimize distortion and maintain field flatness. - Manual focus design is accentuated by a knurled metal focusing ring, 180° focus ring rotational angle, and engraved depth of field and distance scale markings. - The manual aperture ring has 1/2-stop clicks throughout the f/2 to f/22 aperture range. Using the included De-Click Tool, this ring can be mechanically 'de-clicked' for smooth, silent rotation throughout the aperture range; making it ideal for video applications. Pairing an all-manual control-set with a digitally-optimized design, the ZEISS Loxia 50mm f/2 Planar T* Lens is a normal prime lens for full-frame Sony E-mount mirrorless digital cameras. Its manual focus design has been developed in specific regard for use with electronic viewfinders, and also features a manual aperture ring that can be 'de-clicked' for silent operation best-suited for filmmakers. Based on the symmetrical Planar optical concept, this lens is adept at correcting for chromatic aberrations and distortion throughout the aperture range for maintained image consistency and clarity. Additionally, a ZEISS T* anti-reflective coating has also been applied to individual lens elements to further reduce lens flare and ghosting for enhanced image clarity and contrast. Serving as a unique option for the contemporary image-maker, the ZEISS Loxia series of lenses are built for the imaging demands of modern full-frame digital cameras, yet are founded upon conventional manual controls. Offering a perspective reminiscent to normal eyesight, the 50mm focal length pairs well with the fast f/2 maximum aperture for greater control over focus position and performance in low-light conditions. Furthermore, the handling details of the lens have also been enhanced for maximum feedback and precision, including a long 180° focus throw, clearly engraved scale markings, and a robust, all-metal construction with weather-resistant lens mount gasket. Additionally, the lens is fitted with an electronic interface that conveys all EXIF data to the camera and can also be configured to automatically activate camera-based focusing aids during use. - Prime normal-length lens is designed specifically for full-frame E-mount mirrorless digital cameras. However, this lens can also be used with APS-C-sized E-mount cameras, where it will provide a 35mm-equivalent focal length of 75mm. - Based on the Planar optical concept, the lens features a symmetrical six element-in-four-group design that helps to reduce distortion and chromatic aberrations. A compact short telephoto prime for full-frame Sony E-mount mirrorless cameras, the Loxia 85mm f/2.4 Lens from ZEISS is an ideal portrait-length lens characterized by its sleek form factor and impressive optical qualities. Utilizing an optimized Sonnar concept, the simple seven elements, seven groups design incorporates three anomalous partial dispersion elements to greatly reduce chromatic aberrations and color fringing for notable clarity and color accuracy. Additionally, a ZEISS T* anti-reflective coating has also been applied to the individual lens elements to control lens flare and ghosting for improved contrast when working in strong lighting conditions. Loxia lenses are distinct in that they feature a manual focus design that has been specifically tailored for use with electronic viewfinders, and also feature a manual aperture ring that can be de-clicked for silent operation; making them especially well-suited to filmmaking applications. The all-metal lens barrel incorporates engraved focusing and depth of field scales, and a 220° focus throw offers fine-tuned control over focusing position as close as 2.6' away. Additionally, a weather-resistant gasket is featured at the lens mount to protect the lens-camera interface from dust and moisture. - Prime portrait-length lens is designed specifically for full-frame E-mount mirrorless cameras, however can also be used on APS-C models where it will provide a 127.5mm equivalent focal length. - An f/2.4 maximum aperture permits working in low-light conditions, offers control over depth of field, and also helps to maintain the compact overall form factor of the lens. - Based on the Sonnar optical concept, this lens incorporates three anomalous partial dispersion elements to greatly reduce chromatic aberrations and color fringing for increased clarity and color neutrality. - Manual focus design is accentuated by a knurled metal focusing ring, 220° focus ring rotational angle, and engraved depth of field and distance scale markings. 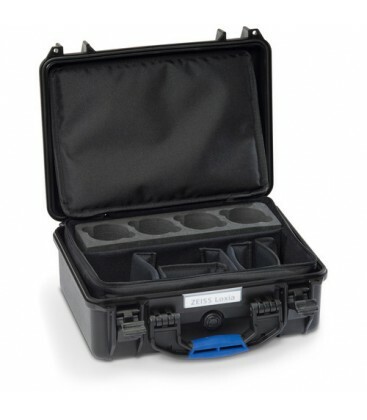 Keep your set of Loxia lenses safe during transit or storage with this Loxia Transport Case/Bag from ZEISS, which also features room for a couple cameras and accessories. 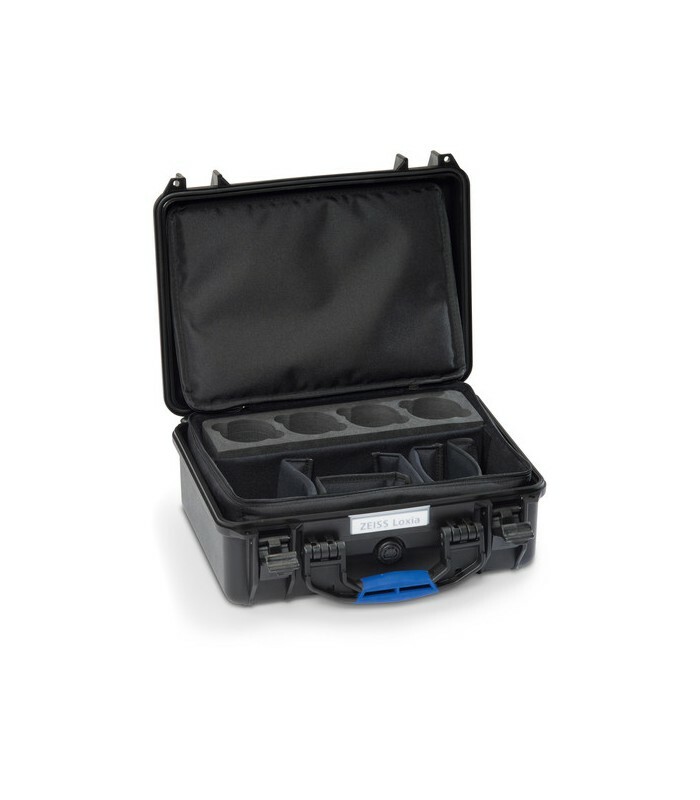 The polypropylene hard case is water and dustproof as well as impact and corrosion resistant, providing phenomenal support of your equipment in a range of environments and situations. It also has a top handle for easy carrying. 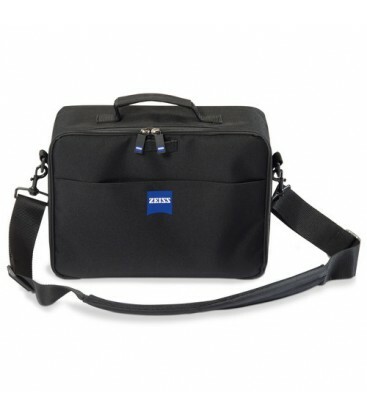 The significant advantage of this case, however, is the removable 100% polyester bag on the inside, which safely holds your equipment and offers another method of carrying your gear when the hard shell is not needed. This interior bag comes equipped with a foam inlay for up to four Loxia lenses. This custom-designed setup cushions and protects the lenses from vibration and shock. The remaining space features padding along with removable dividers to keep everything organized and safe. 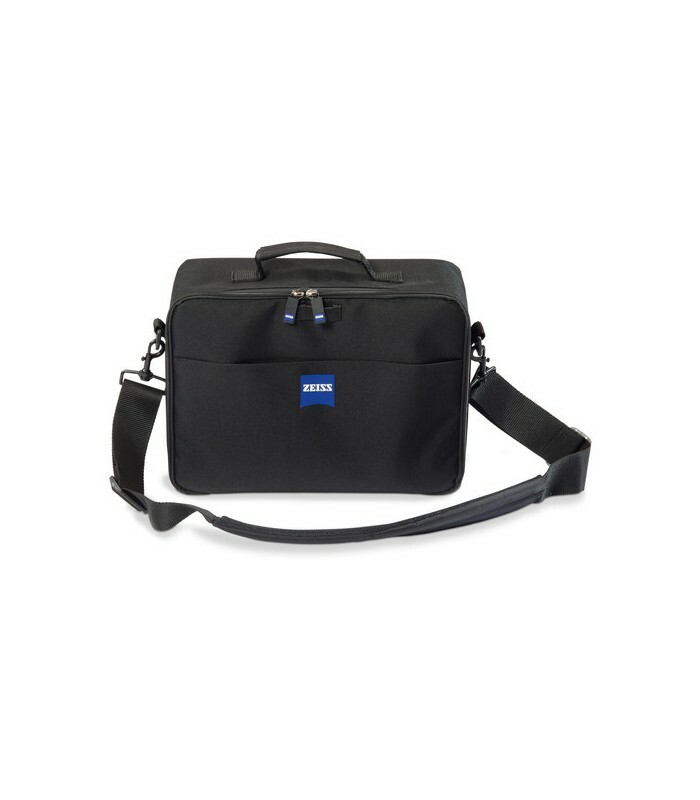 Additionally, the bag accepts a removable shoulder strap and has its own top handle for carrying. Transform any of your lenses into cinema-ready optics with this mini Lens Gear from ZEISS. Designed to slide onto lenses measuring 62-69mm in diameter, this ring allows you to easily equip a lens with an industry-standard 0.8 Mod gear that will enable to use of a follow focus system for smooth, deliberate focus pulls. It attaches quickly and without the use of any tools thanks to a twist-tightening mechanism. A rubber-covered GumGum is included as well, which can allow users to fit the gear on smaller diameter lenses measuring 60-67mm in addition to protecting the lens' focusing ring from scratches and other damage. Additionally, this piece of equipment is very durable, featuring a lightweight aluminum construction with a hardened surface coating.